Summary Broadcom-based simultaneous dual-band N router with Gigabit ports, USB drive sharing and media serving support. 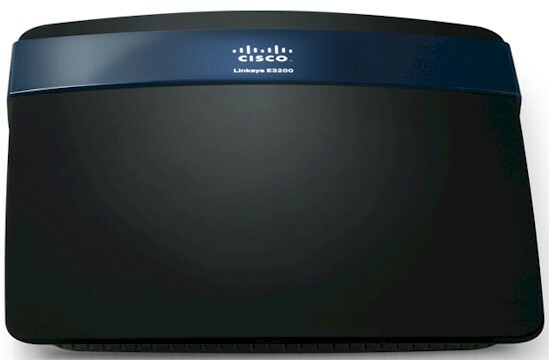 The Linksys E3200 is one step below the top-of-line E4200. It's aimed at folks who don't care about three-stream N support and would rather have the extra cash. The only other thing you trade off vs. the E4200 is a UPnP / DLNA media server added to the USB drive-sharing feature. The E3200's enclosure is more like its lower-priced siblings with a narrower footprint and colored logo accent band running across the router face. The beauty shot above and rear panel photo below show the indicator-free top face and Etherent link / activity LEDs built into the Gigabit WAN and LAN jacks. I opened up my review sample after testing was done and took the photo shown below. The 3200's smaller footprint (compared to the 4200) made for a more compact, but similar layout. I've listed the E3200's key components, along with the E4200's for comparison, in the table below. Both routers are Broadcom-based and have 64 MB of RAM and 16 MB of flash. Like most other simultaneous dual-band routers, both use a single-chip router solution for one of the radios and main CPU. The E3200 uses a BCM47186 vs. BCM4718 on the E4200. And since the E3200 doesn't support three-stream N on the 5 GHz radio, there are only two antennas for it vs. the E4200's three. The 1.0.00 build 13 firmware I used for testing didn't support IPv6. See the E4200 review if you need a bit more feature detail along with some screenshots. First power-up of the router didn't automatically result in Internet connection via a DHCP-style WAN link, so I fired up my browser, entered the 192.168.0.1 IP of the admin server and was presented with the screen shown below. I'm not a Cisco Connect fan, so clicked the Continue with an open and unsecured network (not recommended) link and was shown the screen below. Once I checked the box and clicked the Continue button, I was finally granted Internet access.